Suggested fixes for small visual issues in Kirigami. Idea of which is to slowly go through everything and make tiny tweaks to see if we can make overall design even better. 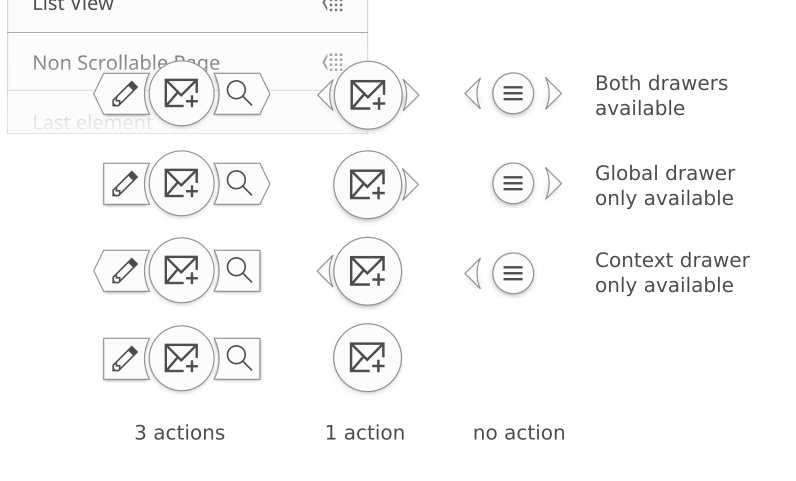 jensreuterberg added images: Breadcrumbs, Main Button Icon Size, Global/Contextmenu Handles. jensreuterberg added a project: Kirigami. Here there is the original mockup I made for FAB in all possible cases. I like all the changes except the ">" symbol, I think that the one from Breeze is better, it just needs some size and alignment adjustments like the text labels. If possible it would be good to have the icons scaled by an integer (x2, x4 etc) because Breeze takes advantage of pixel perfection. Possible solution: maybe the primary one could be 22x22px ( x1 normal dpi/desktop, x2 hidpi/mobile) and the secondary ones 16x16px (1x normal dpi/desktop, x2 hidpi/mobile) ?